If you are looking to relocate in the Kansas City Metro area of the “Show Me State,” you should consider the real estate options of Lee’s Summit. Lee’s Summit is a wonderful place to buy a home and boasts so many remarkable features and amenities, it is no wonder why it was recently named one of Missouri’s “Top 10 Happiest Places.” Within Lee’s Summit there are abundant real estate options, all sure to impress prospective homebuyers. 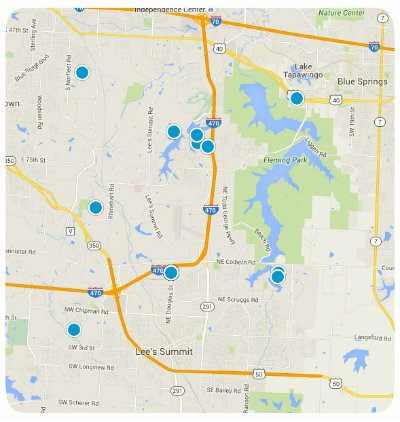 The neighborhoods, communities and subdivisions of Lee’s Summit are diverse and full of wonderful homes for sale. One of Lee’s Summit’s most noteworthy communities is that of Chapman Farms. Chapman Farms is a large subdivision comprised of four smaller neighborhoods: Lakeside at Chapman Farms, Greenbriar, The Meadows and The Shores. Situated in the 64086 zip code, The Shores of Chapman Farms have gorgeous lakefront properties for sale. While the median listing price of a home in Chapman Farms is around $318,000, or $124 per square foot, homes for sale in The Shores at Chapman Farms have an average listing price nearer to $406,000. The Shores at Chapman Farms is located east of Lake Jacomo and east of Highway 7. Residents of The Shores not only enjoy beautiful lakefront property, but also have convenient access to excellent dining, shopping, recreation and entertainment. If you would like to buy a waterfront property in The Shores at Chapman Farms of Lee’s Summit, Missouri, or if you have questions regarding homes for sale in other Lee’s Summit communities, please do not hesitate to contact us today.